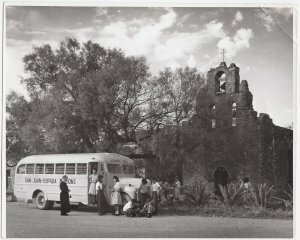 "San Antonio Missions: Our World Heritage" tells the story of San Antonio's five Spanish colonial missions in historic photos, drawings, and maps found in the collection of the San Antonio Conservation Society Foundation Library. This exhibit provides an additional resource for teachers in conjunction with the San Antonio Conservation Society's Heritage Education Tour program for Texas history students. The Spanish mission system was developed with three purposes in mind: the conversion of the Native Americans to the Roman Catholic faith; the extension of Spanish civilization; and the defense of the northern frontier of the Spanish empire in the Americas. Franciscan priests founded San Antonio's two earliest missions: San Antonio de Valero, located south of San Pedro Springs in 1718, and San José y San Miguel de Aguayo, built south of the center of Spanish defense at San Antonio de Bexar, in 1720. By the late 17th century, New Spain had thwarted French incursion into Eastern Texas, and, after the Spanish Crown withdrew financial and military support, the East Texas missions were closed and relocated. 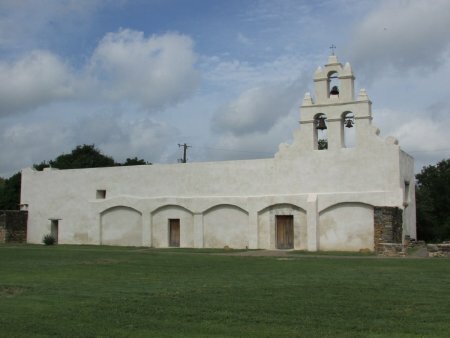 The Franciscans moved three of these missions close to the banks of the San Antonio River, not far from Mission San José, in 1731. These missions became known as Nuestra Señora de la Purísima Concepción de Acuña, San Juan Capistrano, and San Francisco de la Espada. Today, the restored missions remain an active part of the community, still functioning as parish churches. Missions Concepcion, Espada and San Juan's churches belong to the Archdiocese of San Antonio. 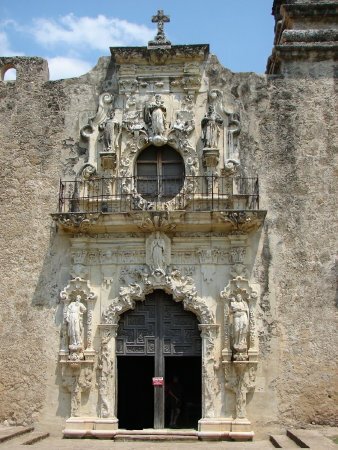 The church at Mission San José belongs to the Franciscan Order of Friars Minor, but all of the missions lie within the San Antonio Missions National Historical Park, owned by the National Park Service. On July 5, 2015, the United Nations Educational, Scientific and Cultural Organization (UNESCO) awarded World Heritage status to the San Antonio missions, the only U.S. site to be considered during the 39th session in Bonn, Germany. Of the over 1,007 World Heritage Sites in the world today, only 22 of them lie within the United States. The San Antonio missions are the first World Heritage site in Texas, and now rank with historic sites the world over, like the Taj Mahal and the Great Pyramids. Each page features images connected to the booklet text. You may click through each page to see it in the same order as the booklet. However, you may also click the Table of Contents to select any image to view. The exhibit consists of 38 pages, each illustrating specific topics described in the Heritage Educators Booklet with multiple photos, including historic building interiors and architectural features. Clicking on an image opens an enlarged version in a new window. You can also click the link provided for most photos to access the full record in our Online Catalog . Exhibit Home Page will return to this page of the exhibit. Library Home Page will take you to the Library web page. Table of Contents takes you to a list of individual images. You may jump to any one by clicking View Full Record. Jump to Beginning will return you to the first content page of the exhibit. Jump to End takes you to the last content page. Content may not be copied or reproduced without permission of the San Antonio Conservation Society Foundation. 2015 San Antonio Conservation Society.